At some point in time, every mom thinks their kid eats too many peanut butter and jelly sandwiches. And then we worry if that’s a good or bad thing. There has yet to be any child who has become sick or developed a disease from eating too many PBJ’s, so let’s put our minds at ease. Instead of worrying about the quantity, we should be more concerned with the quality. Whole wheat flour is less processed and contains more nutrients than white, plus the bleaching process and enriching of white flour is adding more steps and chemicals than are really necessary. Make the switch by subbing half whole wheat flour in homemade bread. In all honesty, the kids only notice the difference in their first sandwich. Choose the “eat it or go hungry” route and you won’t run into that problem again. 😉 You can also buy whole wheat bread, but choose a healthy wheat bread. If you’re using peanut butter with hydrogenated oils, switch to all natural or even organic peanut butter. At a minimum, read the label and choose one without the plastic! Finally, get rid of the Smuckers. Have you read the ingredients lately? From their site: CONCORD GRAPE JUICE, HIGH FRUCTOSE CORN SYRUP, CORN SYRUP, FRUIT PECTIN, CITRIC ACID, SODIUM CITRATE. Wow. There isn’t even any fruit in it! And high fructose corn syrup (HFCS) being second in the lineup should shake us up big time. Remember how coffee creamer is closer to plastic that food? Unfortunately, HFCS isn’t too far off. And to think that I used to worry about finding good deals on this stuff!! Instead of using traditional jelly, try thinly sliced bananas, peaches, pears or apples on the other side of the bread. If you must have a spreadable somethin’ to accompany your butter, make your own. Fruit butters are SO easy to make, especially for those who are pectin-challenge (ahem, me). See, me and pectin don’t get along so well. Our last battle ended with strawberry puree burned onto my wax paper. My ego is still bruised considering the “simplicity” of the recipe. I’m just not ready for round two yet. So for now I’m sticking to the crock-pot. My trusty, don’t-worry-I’ll-do-it-for-you slow cooker that hasn’t failed me yet. And this is important when the kids are going through PBJ withdrawals! The beauty of fruit butters is that they’re whatever you make of them – literally. Buy (or pick) whatever produce is in season, wash it, half or quarter it and throw it in the crock pot. Add a squirt or two of honey or maple syrup and read a book. The next day you’ll have super mushy fruit that your immersion blender will turn into a fresh and chemical-free spread for your sammies. Our current fruit butter in the fridge is strawberry apple. It came from marked-down, over-ripe strawberries at the farmer’s market combined with the first pickings of the apple season. The flavor of the strawberries deepens in the cooking process, and the apples compliment the richness so well. The optional smidge of honey brings it all together. 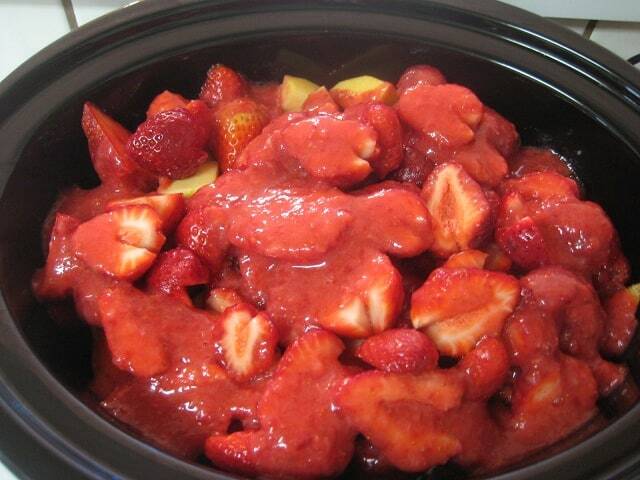 In a 6 quart slow-cooker, combine strawberries, apples and honey and cover. Cook on medium-low for 12-18 hours. Puree mixture with an immersion blender. Prop lid open with a knife or chopstick (or the like, see below) and cook for another 2-6 hours on low, or until the mixture thickly coats the back of a spoon. The propped open lid will allow excess water to evaporate. Once the desired consistency is reached, allow to cool and then ladle into glass jars. Butter may be kept in the freezer for long-term storage. Makes enough to fill three 16oz jars. Kitchen Tip: Unless you’re my neighbor, strawberries are not in season. Frozen can be substituted or the berries can be omitted altogether. Experiment with whatever is available! I love how easy this is to make. When I’m in a pinch, I’ve been known to make peanut butter and honey sandwiches. I figure honey is better than jelly and you only need a little bit. PB & honey is SO GOOD! I’ve learned to smear a thin layer of PB on each piece of bread and THEN honey, otherwise the bread soaks up the honey and it gets hard and not so appealing anymore. That looks delicious. Thanks for educating us on HFCS. Your blog has made me hyper aware of eating this toxic plastic !! This looks delicious! How long does it keep in the refrigerator? Can it be frozen? Thanks so much! Good to know it lasts a while. Can’t wait to try it! Oh, this looks yummy! And easy enough for me to do! I think even the most kitchen-challenged person can handle “wash, chop, cover, go” LOL! I made apple butter for the first time this fall (in the crock pot). Our family LOVES it! The addition of strawberries sounds delish, I’ll be trying this next time. Thank you for posting your real food recipes. Our family has been slowly changing over. p.s. If you are short on freezer space, you can use the ‘fill and flip’ canning method. In short, fill canning jar with hot apple butter, put new lid on, and flip onto the counter. After a certain amount of time (slips my mind), flip back over, and jar seals itself. Helps when there is more pantry room than freezer space. You’re welcome Theresa – it’s all about those baby steps! What a FANTASTIC idea on the canning method!! If I could run up to you and hug you, I would – seriously! I always have more pantry than freezer room and this will help immensely. Does it work with all canning stuff? Like spaghetti sauce too? the fill and flip method is not considered safe. There is still the possibility of botulism. Jam’s not as simple as it looks, and jelly’s really not that simple. The act is simple, but you really have to know what you’re looking for to get to the set and gel stage. It does get easier after the first few batches, but a lot of people I teach canning are surprised if/when their first batch doesn’t set right. 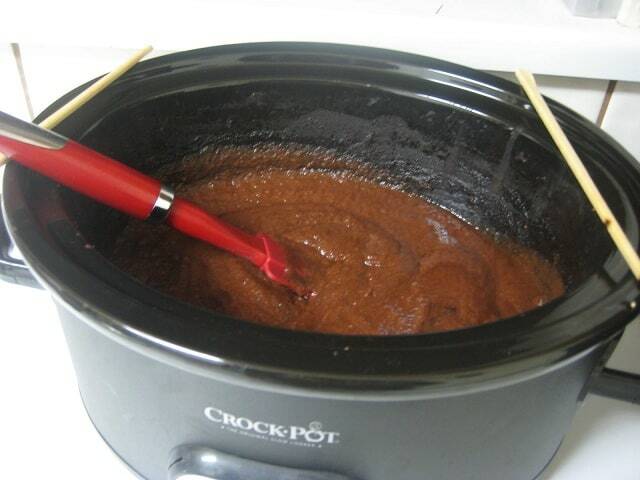 I love crock pot fruit butters. So simple. I feel the same way Katie! My mother-in-law makes fantastic jelly, so I’ll just wait for her shipments. Me, I’ll hit go and be on my merry way, lol. What a fantastic idea. I love fruit butters and they are so much more nutritious than commercial jams. I like your crockpot recipe! Oh this is for me!! I’ve not done too well at jam or jelly, but love the slow cooker and have made applesauce in it. This sounds so simple and delicious – thanks! You’re welcome Lisa! I’m on my last jar of this and was secretly hoping to stumble on persimmons at the store yesterday. Can’t you just taste a persimmon butter with a hint of raspberry? Mmmm! I have enjoyed reading about your healthy recipes. I have been making fruit butters in the crockpot this past year and I love them. I am a diabetic and have been making them sugar free and that means no honey either or any of the stuff like stevia. I personally do not like the after taste. When the fruit butter is ready to be put into jars, I do that and then put them into a ten minute water bath just to be on the safe side. They seal quite nicely. Then they go on the shelf where they get opened as needed. This past year I made apple butter, fig butter, apple-fig butter, and blueberry butter. Tiffany, just checked out this older post of yours. LOVE the idea of making a fruit butter with strawberries or other fruit. I’ve only made it using apples before. What other fruits have you used? I’m wondering how peaches or pears would work… We just finished making homemade jam (it’s strawberry season here now) using Pomona Universal pectin (buy it at Vitacost.com) which uses a different type of pectin that does not require sugar to activate it. It requires a calcium water which you make using the packet included in the box. I love this type of jam because I know it is MOSTLY fruit (I use some honey to sweeten) and it has always set for me. Might be something you’d like to try. I agree with Beth. I don’t recommend anything but a hot water bath in a canner for preserving fruits/pickles/tomatoes, etc., and anything non-acidic requires a pressure canner! It’s better to be safe than sorry! My most recent batch was maple vanilla pear apple butter… I couldn’t make up my mind which to make, so I made it all! I bet peaches would be awesome. Maybe with some rhubarb since it’s in season? Mmmm… I put the butter in pint canning jars which fit well in my freezer door. I’d like to can this or spaghetti sauce, but we go through the spaghetti sauce way too fast to bother canning, and the butters don’t take up much freezer room at the moment. Now if I’m going to come into a HUGE amount of something, I’ll whip out that big ‘ol canning pot and use the hot water bath method. You’re right – best be safe! Do you always also use apples? Ir could you do just berries? Will this method work for other fruits? Grapes, blueberries, or peaches? Sure does Natalie! I’ve made butters using apples, peaches, blueberries and blackberries. I haven’t tried grapes yet, but I don’t why it wouldn’t work! Is there a generic version of this recipe to have a general idea how much fruit to use in a batch? Or is it dependent on the fruit since they may cook down differently? I can’t do much with apples, but would still like to experiment and get roughly the same amount of butter at the end. Thanks for the idea – I’ve been working on cutting out artificial ingredients for a while due to digestive problems that seem to be aggravated by eating processed food. When I eat only what I make for myself then I have hardly any symptoms at all! Real food has become a real necessity. Hi Erin! It really does depend on the fruit, since they all start with different sized and cook differently, but if it were me, I’d just fill up the slow cooker to the top and watch the consistency as it cooked. Taste and sweeten as needed halfway and call it good, and I’m betting you’d get roughly the same amount! Wow…I don’t know why all these years I never came across a recipe for homemade fruit butter nor searched for it…Meanwhile, I bought Apple Butter from the store. 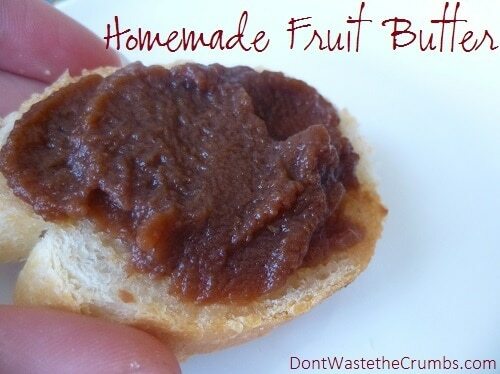 Homemade fruit butter is amazing…Never buying store jelly, jam or preserves. I made maple syrup granny smith apple and strawberries this week. I am surprised how easy it was to make. It is delicious. Ever tried adding chia seeds? I’ve heard it helps make a quick jelly but I don’t know how long it lasts in the fridge this way…. ?? Hi Kim! Chia seeds make any liquid “gel,” so it mimicks the texture of jelly, but doesn’t really do the same thing… it’s more like a pudding? I did this last week with coconut milk and it was quite interesting, lol!! Loved your comment on eating too many PB&J’s. They were my most favorite thing to eat when I was younger. My mother was happy to oblige. She made many for my school lunches and at home too. I still love them, just not everyday anymore and on whole grain bread. Toasted please. Add a banana to it for that extra goodness. There was a time in my life when I need to put on a few pounds. PB&J was the way to go. Anxious to try your fruit spread recipe. Thanks for the tips in making it. Yes I do Erin! This is so funny – I made it again this past fall and didn’t write it down, AGAIN! I’ve already made a note for this year! Well I can’t wait to see that one! I’m trying the strawberry apple for sure!